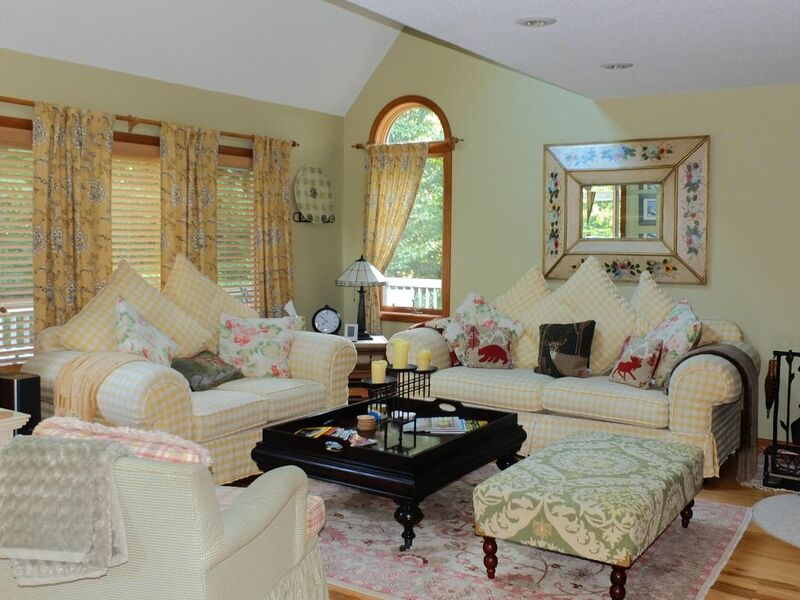 5 bedroom, 3.5 baths, 3 separate living areas, sleeps 10 adults,12 /w children. Luxury home, located 10 minutes from Stratton or Manchester, 5 minutes to Bromley. Spectacular winter views of Bromley Mountain. Large open floor plan with plenty of space for families. Living /dining/kitchen with cathedral ceilings/skylights, fireplace and master suite with jacuzzi tub, all on first floor with sliders leading to wrap-around deck. Comfortable, upstairs loft with TV/DVD, also with full bath, and two queen bedrooms. Two more bedrooms and full bath with separate family room and laundry room on lower level. Large screen cable TV/DVD, stereo. Sleeps 10 adults, 12 with children. Newly remodeled kitchen and baths. Perfect for families. Skiing: House is in a wonderful location between Stratton and Bromley Mountains as well as being very convenient to Manchester for shopping and restaurants. Ten minutes to Stratton or Manchester, five minutes to Bromley. Rentals: We charge 20% to book and the remainder 30 days before the rental. There is a cleaning fee. No minimum # of days. Our rates are flexible according to number of days, time of year and partial season rentals. Fully and nicely equipped with everything you need if you enjoy cooking. Lovely property, close to the slopes! Everything you could need or want was there, and when we were hit with rain turned ice, someone was soon there to try to help us out! Apart from the weather, everything was great! Thanks you for your kind words. We are glad that everything worked out well for you. This house was so great!!.. Don was so easy to work with and very prompt returning my emails, etc. He sent the key in the mail along with written instructions one week before our trip. House was great for the kids, who were able to sleep in the basement and have a separate play area. Kitchen was big and well stocked. House was very clean.. Bed Linens and towels were provided. Only negative thing was that it was very hard to find at night since the street is so dark. If using GPS, better to use Google Maps.. Waze took us to the wrong house. Thanks for your review Steve. We appreciate any and all feedback. We are glad that you enjoyed your stay and invite you to stay again in the future. We just came back from spending MLK weekend at the Riccio house. There were 6 adults and 4 children and we had plenty of room. The house comes fully equiped. It's clean and beautifully decorated. We especially liked the location. You can ski at Bromley or Stratton and shop in Manchester. We plan on renting for a week this summer to hike and try the Bromley Mountain Adventure Park. Great house!! Rented the Riccio's house with another family this past Christmas recess and could not have been more pleased. House is fantastically well maintained and plenty of room for the kids! If you're looking for a great house near Bromley/Stratton, you can't go wrong here. We will absolutely be coming back.....thank you! This is a great house! We spent 5 days there with 6 adults and 4 kids. We had room to spare, I think this would be ideal for 3 families, each with 2 kids. The kids took over the basement and had their own TV. The adults relaxed in the quiet upstairs. With no snow the first few days, it was nice to have the space to stretch out. We have always been a Stratton family, but I have to say I LOVED the proximity to restaurants and shopping, the kids had a great day at Bromley, and Stratton was only 15 min away. We also had a fun time exploring the woods and sledding on the property. Appliances are all in great shape, kitchen is beautiful, house was clean and comfortable, Owners are great to deal with. We will definitely rent here again! We appreciate your review. We look forward to you staying again in the future. We spent a great Columbus weekend at Riccios' house. We were 4 couples with one baby and a toddler. Our stay was enjoyable for every one of us. The house is in a great location for foliage. Very quiet area, trees around the house were in all beautful fall colors, and the sound of the creek by the house make it a perfect outdoor enjoyment. There is way so much space in the house and everything is very well organized. Eating and sitting area blends together and open space makes the get together even more enjoyable. I love the fact that they don't have a tv in the living room, upstairs sitting area with a tv was perfect for my daughter. There were toys available for her too, so she loved this house, she was so sad to leave. There is a huge balcony with very comfortable lounge chairs, we had a nice evening listening the creek. Fireplace added a very warm touch to our stay, firewoods were available, and everything was easily manageable. We were in love with the kitchen, so detailed organized and clean. We will definetly come back to this house. Thank you for your wonderful review. You certainly noticed features of the house which we like as well. Its nice to know that we can give folks an enjoyable stay. Fantastic location between Stratton Mountain, Bromley Mountain, and Manchester. Convenient to skiing Stratton and Bromley and shopping and restaurants in Manchester. Other Activities: Manchester shopping is just 5 minutes away. Hiking, kyaking, biking, snowshoe, nordic sking, antiquing, art studios, farmers markets, farm to table restaurants, fitness center, golf, tennis, waterfalls. $475.00 per weekend night ski season, call for holiday, off season, multi night, and week nights. Ski Season $475/weekend nights, $400/weekday nights Fall and Summer $1200/week, $300 night Call for multi-night/holiday/off season/seasonal rates Ski Season $475/weekend night. Call for multi night/holiday/off season/seasonal rates.